Proposition 65 is a California law that requires warnings on products and areas containing chemicals “known to the State of California” to cause cancer, birth defects, or reproductive harm. The law was supposed to keep people safe from toxic chemicals, but today it’s responsible for meaningless warnings on everyday items like coffee, flip-flops, and toothbrushes. The warnings are everywhere, and consumers have tuned them out. Instead of protecting public health, Proposition 65 has evolved into a tool for trial lawyers to earn millions collecting settlements against small businesses whose products don’t actually put consumers in harm’s way – even if the businesses are located outside California. Although California’s Attorneys General have prepared annual Proposition 65 settlement reports detailing the plaintiffs, defendants, and breakdown of settlement values since 2000, no one knew exactly how much money businesses in each state were paying to settle Proposition 65 lawsuits. 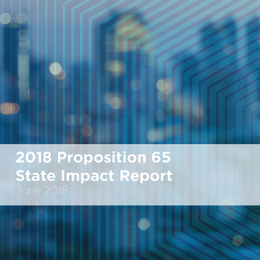 The Center for Accountability in Science’s first annual Proposition 65 State Impact Report is a first of its kind state-by-state overview of the negative financial toll California’s Proposition 65 (Prop 65) exacts on businesses nationwide. 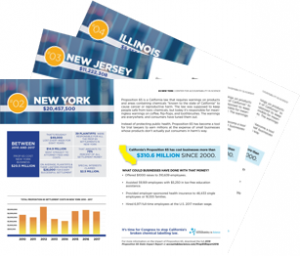 View the full report website here.